Eden Place is a safe, secure community providing support for people with memory loss. Our loving surroundings provide a benchmark for the person – centered model. The specially trained staff understands characteristics of memory loss and utilizes their expertise to stimulate cognitive and physical activities in a caring and loving manner. 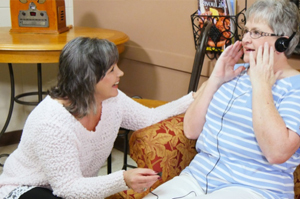 Our music and memory program successfully demonstrates our on-going mission to assist our residents with the latest techniques in dementia care. "Music & Memory" is an exceptional, personalized music program grounded in extensive neuroscience research. The Oaks has obtained certification status through the Department of Health and Hospitals.